Home / NEWS / Easier Life With Flying Cars! Easier Life With Flying Cars! Flying cars – they used to be the stuff of science fiction movies where every day ordinary-looking cars sprouted wings, concealed jet-engines or ducted fans took off from a road and flew away. For over eighty years inventors have been tinkering with the idea of a practical roadable aircraft. Some flew and some didn’t and a great many didn’t make it past the drawing board. The most successful of them all, then, which actually flew, was Moulton Taylors Aerocar of 1949; it drove like an ordinary car and had detachable wings which you towed behind and affixed them once you got to an airfield.Unfortunately, despite its popularity it never made it into production. With a flying car it means you can take –off from an airstrip, close to your home, soar over the grid-locked traffic below, land close to your destination and drive the rest of the way. 1, Uses folding or retractable wings. 3, Is suspended beneath a para-foil or ‘oblong’ parachute. 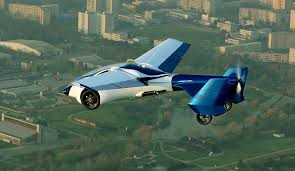 Terrafugia Transition is a 2-seater roadable aircraft that has a pair of wings that fold along its sides. For flight operation the two wings unfurl like a jet-fighter on an aircraft carrier and a pusher propeller situated in the rear propels it forward. Its small enough to fit into a home garage and can go up to 110km/h on the road. The Aeromobil 3.0 on the other hand has wings that retract into the vehicles body, like a beetle, for road operation. When it’s ready to fly the wings slide out, aided by hydraulic mechanism and it’s powered by a pusher propeller. In the event of a mishap a ballistic parachute lowers the vehicle and the occupants safely to the ground. This( – parachute) proved to be a lifesaver when a prototype suffered a fault in 2015 and crashed saving the life of the pilot with only minor damage to the vehicle. 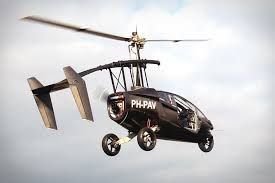 The next class of flying cars such as the PAL-V uses rotors rather than wings to fly. Looking very much like a mini-helicopter it works on the principle of a gyrocopter; the rotors spin around freely as a result of the vehicles forward motion through the air rather than driven by an engine like a helicopter. To drive on the road the rotors are folded back manually and stowed away on top of the vehicle. The current 3-wheel PAL-V prototype has STOL capabilities, does 170 km/h on the road and up to 180km/h in the air. 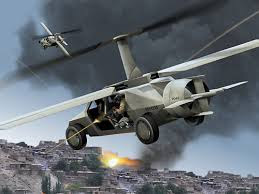 Using this concept, DARPA, the American research agency is developing a 4-wheel drive flying ATV called Transformer TX that will be able to ferry up to four troops in and out of battlefields. 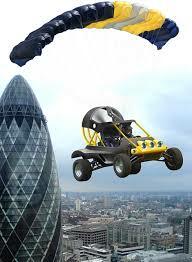 The third category of flying cars is the easiest to build and fly. Based on the sport of powered para-gliding it’s basically a propeller powered dune buggy suspended beneath a large parachute. Very simple in concept all it needs to fly is forward motion to inflate the parachute canopy from which it is suspended. In 2009 a British team flew the Parajet skycar from London to Timbuktu on a 42-day expedition that took them through France, Spain, Morocco, across the Sahara desert to Mauritania and Mali flying all the way and only stopping to refuel or rest. The vehicle required very little maintenance and is currently available to buy. Anyone wishing to procure a flying car in the not too distant future will have to have at least a private pilot’s licence in addition to a driving licence. Learning to fly them will require anything up to twenty hours of additional training that will be provided by the manufacturers. Flying them shouldn’t be too difficult to flying a plane as most of them will come with state-of-the-art-fly-by-wire systems that will make them, theoretically, un-crashable and easy to fly. Classified as experimental aircrafts, users will be required to stay out of controlled airspace, built-up areas and flying at night will be forbidden. 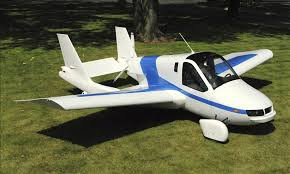 So if you’re fed up of being stuck in ‘go-slow’ all the time why not get yourself a flying car(- if you can afford one!) and soar high above the traffic gridlock every day?